It is almost like Nikon is in bed with the memory, hard drive and computer manufactures, doesn’t it? I have seen people say it is just part of upgrading. Almost every new camera over the last five years has increased MPs which means upgrades throughout the digital darkroom. Interesting those people are well established professional photographers who make more money these days in teaching and reviewing photographic equipment then from their photography. For us other photographers who do not have the budget, having to upgrade a computer, get more storage space and larger and different memory cards is a pretty big investment along with the camera. My new 3TB external hard drive suddenly does not look like it would be enough. I tend to agree with Scott Thomas, but I must say that these improvements are certainly worth it. 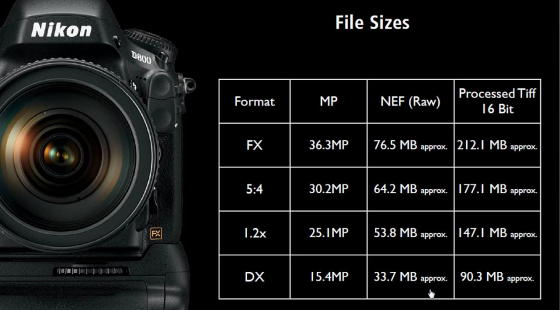 The images from the D3x and D800 are nothing less than breathtaking. I Print 20×30 and larger on a regular basis, and the resolution and clarity of the finished print is fabulous. aside from the resolution, the tonal graduations, the absolute accuracy of the colors and the contrast speaks volumes.